At last my works are available at http://www.etsy.com/shop/oiolinIt was good and sad to sell the Red Kangaroo, I loved that curious little one a lot! 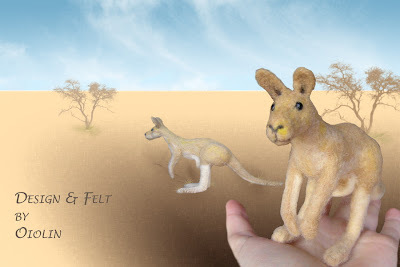 Well, missing kangaroos in my house :) nowadays I’m felting another one… it is always a surprise what the sculpture is going to look like in the end. We’ll see. Easter rabbit came too early? Don't eat these fruit! They are pure merino wool!